"Eat You Alive" is a song by the band Limp Bizkit. It was released in September 2003 as a single from their fourth studio album Results May Vary (2003). The song was written by Fred Durst, John Otto, Sam Rivers and Mike Smith, and is Limp Bizkit's first single without Wes Borland, who had left the band in 2001. In promotion of the single, Durst filmed a music video featuring known actors Thora Birch and Bill Paxton. The single peaked at number 16 on the Billboard Hot Mainstream Rock Tracks chart. Allmusic gave the single one out of five stars. A 2004 readers poll published by Spin tied "Eat You Alive" with "Headstrong" by Trapt and "Me Against the Music" by Britney Spears as "worst song". "Eat You Alive" was included on the compilations Greatest Hitz (2005), Collected (2008) and Icon (2011). ↑ Erlewine, Stephen Thomas. "Results May Vary - Limp Bizkit". Allmusic. Retrieved 7 January 2012. ↑ "Bill Paxton Biography". imdb. Retrieved 26 December 2013. ↑ "Limp Bizkit - Charts & Awards". Allmusic. Retrieved 8 January 2012. ↑ "Eat You Alive - Limp Bizkit". Allmusic. Retrieved 8 January 2012. ↑ "Bad to the Bone". Spin. SPIN Media. 20 (3): 67. March 2004. ↑ Thomas Erlewine, Stephen. "Greatest Hitz - Limp Bizkit". Allmusic. Retrieved 20 December 2011. ↑ Christopher Monger, James. "Collected - Limp Bizkit". Allmusic. Retrieved 20 December 2011. ↑ Thomas Erlewine, Stephen. "Icon - Limp Bizkit". Allmusic. Retrieved 20 December 2011. ↑ "Australian-charts.com – Limp Bizkit – Eat You Alive". ARIA Top 50 Singles. ↑ "Austriancharts.at – Limp Bizkit – Eat You Alive" (in German). Ö3 Austria Top 40. ↑ "Ultratop.be – Limp Bizkit – Eat You Alive" (in Dutch). Ultratop 50. ↑ "Ultratop.be – Limp Bizkit – Eat You Alive" (in French). Ultratop 50. ↑ "Danishcharts.com – Limp Bizkit – Eat You Alive". Tracklisten. 1 2 3 "Polish Singles Chart |". ↑ "Lescharts.com – Limp Bizkit – Eat You Alive" (in French). Les classement single. Retrieved 2010-10-25. 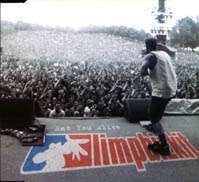 ↑ "Musicline.de – Limp Bizkit Single-Chartverfolgung" (in German). Media Control Charts. PhonoNet GmbH. ↑ "Italiancharts.com – Limp Bizkit – Eat You Alive". Top Digital Download. ↑ "Dutchcharts.nl – Limp Bizkit – My Way" (in Dutch). Single Top 100. ↑ "Charts.org.nz – Limp Bizkit – My Way". Top 40 Singles. ↑ "Norwegiancharts.com – Limp Bizkit – Eat You Alive". VG-lista. Retrieved 2010-10-25. ↑ "Swedishcharts.com – Limp Bizkit – My Way". Singles Top 100. ↑ "Swisscharts.com – Limp Bizkit – My Way". Swiss Singles Chart.